The Bosque del Apache National Wildlife Refuge lies in the heart of New Mexico’s middle Rio Grande Valley. Established in 1939, the 57,000-acre refuge includes about 12 miles of the Rio Grande and 8500 acres of floodplain habitat. These valuable wetlands serve as a winter home for tens of thousands of migratory waterfowl. The refuge also provides critical habitat for a variety of wildlife, including the endangered Southwestern willow flycatcher and Rio Grande silvery minnow. Like most southwestern river systems, reduced precipitation, altered flows from dams and flood-control structures, and introduction of invasive saltcedar and Russian olive disrupted natural ecosystem cycles. 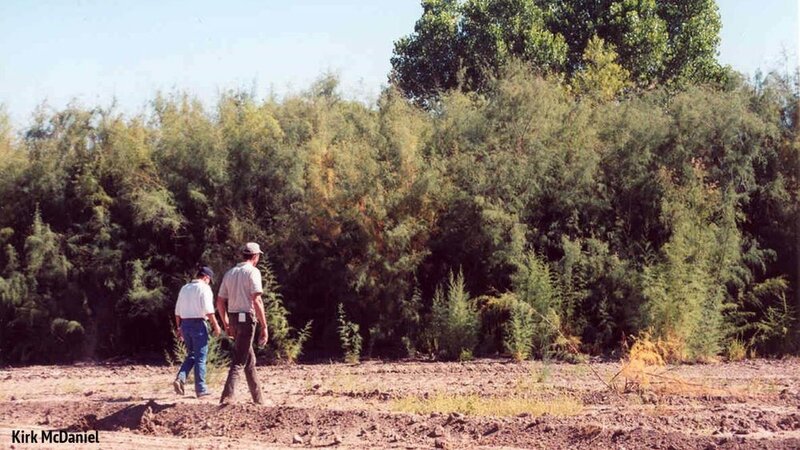 Efforts to manage saltcedar on the refuge began in the 1940s and were greatly expanded in 1986 by the late John Taylor, refuge biologist, along with Kirk McDaniel of New Mexico State University. Today, the refuge is one of the largest riparian restoration programs in the southwestern U.S. This article reviews 32 years of wetland restoration and paradigm shifts that resulted from testing and implementing various saltcedar management tools. In April 1986, a wildfire on the refuge burned about 1800 acres of riparian habitat, including 445 acres of cottonwood and willow forests. Saltcedar was a dominant component of the plant community prior to and following the burn. Taylor developed a restoration plan for 140 acres of the burned area, and the U.S. Fish and Wildlife Service (FWS) provided $335,000 in funding over a five-year period. The plan included saltcedar control, native tree and shrub planting, and irrigation developments. The scope of this project was unique, since many of the proposed restoration methods had not previously been tried or tested on an operational scale. Three management units were identified for the restoration project. Beginning in 1987, irrigation developments and water control structures diverted water from the Rio Grande into new and existing canals. These changes allowed portions of the project area to be flood irrigated. Saltcedar was controlled either by mechanical methods or herbicide spraying, and the woody debris was later cleared by chaining, raking, burning, or a combination of these methods. The effectiveness and cost of various management tools for controlling saltcedar in each management unit were measured (Table 1), and a series of photo's taken over 30 years show restoration success. After clearing saltcedar and before planting, field data (elevation, soil texture, salinity, and depth to water table) were collected across each management unit. This information was used to define and map areas most suitable for tree, shrub, meadow or wetland community development. Planting prescriptions for native cottonwood, willow, and various shrubs were developed based on the ecological site potential. Plants were selected to provide varying structure, age class, floristics, and food source. Land not suited to planting was considered for ponds or other wetland features. Table 1. Description of restoration activities, average control two years after treatment (YAT), and restoration cost per acre. Costs do not include irrigation or soil sampling/analysis. 1986: Saltcedar thicket prior to restoration (Unit 28). 1988: Saltcedar removal and site preparation (Unit 28). 1990: Flood irrigation following saltcedar removal (Unit 28). 2018: THIRTY years following restoration (Unit 28). Establishing native cottonwood, willow, and other woody vegetation greatly reduced the competitive ability of saltcedar; however, saltcedar saplings and resprouts were present in all three management units by 1995. Thus, annual monitoring and periodic spot treatment of saltcedar needs to be an important management component. Natural regeneration of native trees and shrubs occurred quickly in response to flood irrigation. By 1995 regeneration of non-planted species comprised nearly 98 percent of the restored woody composition in the three management units. The high cost of purchasing and planting woody seedlings and cottonwood/willow poles was unnecessary if flood irrigation or natural flooding was available to recruit native plants through natural regeneration. Timing flooding events in spring when cottonwood seeds are being dispersed on land and into river water greatly enhanced natural regeneration. Water from the Rio Grande for wetland development and natural plant regeneration was the key to restoration success. The restoration effort provided habitat for a diversity of wildlife within five years. By the mid-1990s, the planning focus shifted from saltcedar control to identifying potential plant communities that could best be restored. Saltcedar removal, along with water manipulation, planting, or natural regeneration, became steps in the process of achieving long-term restoration goals for the refuge. Deputy refuge manager Bernard Lujan agrees. “We still have saltcedar on the refuge, but it no longer dominates the plant community in most areas,” he explains. Small pockets of dense saltcedar infestations still remain in both the historic and active floodplain, but these areas are targeted for restoration as part of on-going management. Bernard Lujan (left) and Kevin Cobble (right) in Unit 30. Photo taken 30 years after restoration. The John Taylor Memorial Management Area in 2018, about 12 years after restoration. About 80 percent of restored floodplains on the refuge require annual maintenance and control of invasive woody plants. “Russian olive started invading about 10 years ago, so this plant, along with saltcedar, has to be controlled,” explains Lujan. On-going saltcedar removal in the active floodplain with mechanical removal (background), and sapling treatment with Garlon® 4 Ultra (foreground). Natural cottonwood regeneration two growing seasons following saltcedar removal and flooding in the active floodplain. Russian olive invading cottonwood forests on the refuge. Fish and Wildlife Service invasive species strike teams treat saltcedar and Russian olive saplings and resprouts as part of annual maintenance. Ground crews with backpack sprayers or all-terrain vehicles apply Garlon® 4 Ultra specialty herbicide as a basal bark treatment beginning in late spring. Restoration Partners: U.S. Fish and Wildlife Service, North American Wetlands Conservation Council, Rio Grande Agricultural Land Trust, Freeman Electric, New Mexico Department of Game and Fish, Valencia Soil and Water Conservation District, Pueblo de Sandia, Pueblo de Cochiti, Save Our Bosque Task Force, City of Albuquerque/University of New Mexico, New Mexico State University, Friends of the Bosque del Apache National Wildlife Refuge, Middle Rio Grande Conservancy District, private landowners, and Ducks Unlimited. Sanchez, Jeff, Supervisory Biologist, Bosque del Apache NWR. Personal communication. Taylor, JP and K C McDaniel. Restoration of Saltcedar (Tamarix spp. )-Infested Floodplains on the Bosque del Apache National Wildlife Refuge. 1998. 12:2. pp. 345-352 Online. Taylor JP and KC McDaniel. 1998. Riparian management on the Bosque del Apache National Wildlife Refuge. New Mexico Journal of Science. 38:219-232. Taylor JP, DB Wester, and LM Smith. 1999. Soil disturbance, flood management, and riparian woody plant establishment in the Rio Grande floodplain. Wetlands 19:372-382. Taylor JP, Wester DB, Smith LM. 1999. Soil Disturbance, Flood Management, and Riparian Woody Plant Establishment in the Rio Grande Floodplain. Abstract. Wetlands. Vol. 29, No. 2. PP. 372-382. ®™ Trademarks of Dow AgroSciences, DuPont or Pioneer and their affiliated companies or respective owners. State restrictions on the sale and use of Garlon 4 Ultra specialty herbicide apply. Consult the label before purchase or use for full details. Always read and follow label directions.